1. We are Almighty God Allah's (swt) Temple, the New Moors (the newest generation of True Moors), and as such, we are all Moslems standing 100% immutable in Almighty God Allah (swt), Prophet Noble Drew Ali (pbuh), and Islam[ism]. We see and know that "There is no God but Allah" (swt), and that Islam[ism] is our only Divine and Earthly Salvation. 2. We are all Moorish Nationals, like all Moorish Nationals on the soil (ground/land/earth) of all seven continents of Planet Earth, we are Sovereigns seeking our universal Liberation, Independence, Freedom and Equality as all other nations are seeking. Our Power and Authority is from our Heavenly Father, Almighty God Allah (swt) alone, and no man, woman or child on this planet can or will interfere with it. 3. We are the Very Best and Better, constantly advancing, growing, expanding and developing. We are dedicated to extreme excellence and extreme exceptionalism, anything that is average and mediocre is beneath us and our abilities. We have limited ourselves to the limitless powers of the Almighty God Allah (swt), the Great God of the Universe, the Father of the Universe, the Father of Love, Truth, Peace, Freedom and Justice, and we are now unlimited in our own potential and possibilities. 4. We are those chosen and committed to establish Almighty God Allah's (swt) Everlasting Dominion upon the Earth-Land, also called the "Kingdom of Heaven", the "New Moorish World Kingdom", and the "Moslem Ommat" (paradigm and paradise). We once ruled the world, and now is our appointed time to rule it again, but this time under the Divine Laws of the Holy Koran of Mecca; Love, Truth, peace, Freedom and Justice. This is the True and Divine World Peace all of the nations have been seeking. 5. We are the living image and likeness of Almighty God Allah (swt), the Children of the Elohim (Beni Elohim), and the Sons and Daughters of Asia. The Original Cherubim and Angels are our Ancient Ancestors, and the God-Men of tomorrow are our Future Descendants. We are the minds that are the Teeming Life on all seven planes of creation, and the Masterminds of all progressive civilization upon this planet. We are today, what our fathers, forefathers, and ancient forefathers were yesterday, we are the unstoppable and invincible stars of heaven. 1. We know that there is no God but Almighty God Allah (swt), he is the author, creator and governor of all seven planes of creation. We know that Man is the living image and likeness of Almighty God Allah (swt) in flesh, and as such we (all life on all seven planes) all have one father, our Almighty Heavenly Father, Allah (swt), the Great God of the Universe, the Father of The Universe. 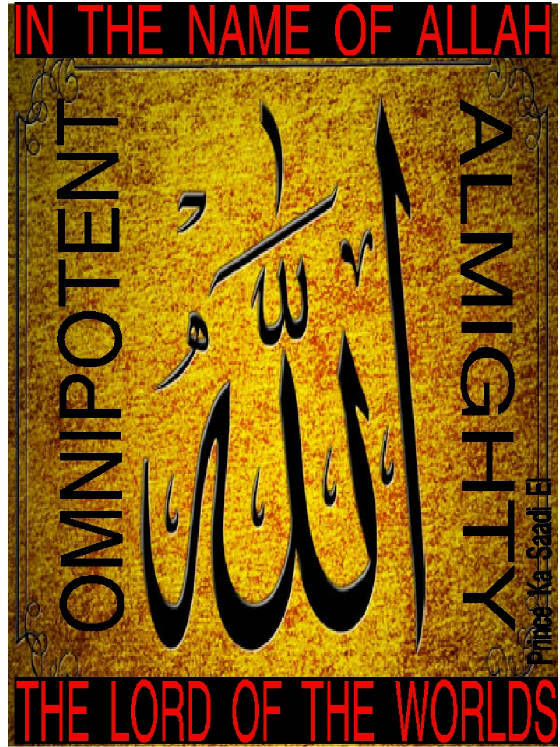 There is but one Almighty God Allah (swt), and he is omnipresent, omnispective, omniscient, omnipotent and omnificent, all the time, and all at the same time. We know that the Infinite Wisdom of Almighty God Allah’s (swt) Supreme Intelligence is Immeasurable, Immutable, Immiscible, Immovable, Immirsible, Impregnable, and Impermeable, which he gave to the first physical man, his successor over the Earth-Land, and now today the Infinite Wisdom of Almighty God Allah’s (swt) Supreme Intelligence is the root/source of our Holy Divine Doctrine of the MSTA. 2. We know that the first physical man is the father of all Asiatics on Planet Earth, whose birth place was in the area now called Mecca, Arabia, and whose children then traveled throughout Asia and Africa, spreading the original and universal True and Divine Creed of Islam[ism] throughout the world. We know that Islam[ism] was his natural way of life, which became the firm foundation of our Divine Creed, and gave birth to our original Societies, Cultures and Civilizations. 3. We know that the Ancient Canaanite Nation are the first sons and daughters of the first physical man, and they are the ancestors of all of the Asiatic Nations today. They are the first Angels, and the founders of the Divine Creed of Islam[ism] which is our religion today, founded by them for the Salvation of mankind (fallen humanity) on Earth. we are all Moslems. They knew that the Divine Principles of Love, Truth, Peace, Freedom and Justice were necessary for the salvation of all nations. 4. We know that Islam was the culture (way of life) of the first physical man, passed down to his sons and daughters, and then formed into a Science for the Salvation of all mankind on earth by them, this is the original and universal religion of man, and it is the only True Saving Power that will raise/return man to being the Lord of Soul and Manifest which was his original and universal state of existence, and is now our inherent and inalienable right. We know that Islam was the religion of Prophet Jesus (pbuh), Prophet Mohammed (pbuh) and Prophet Noble Drew Ali (pbuh), just as it is the True Religion of all Moorish Nationals of any national government. 5. We know that the Moslems, especially of the MSTA, are the modern day angels and chief protectors of Islam[ism] and all of the Holy Cities under the Divine Guidance of Almighty God Allah (swt) through Islam[ism]. We know that in this day and time we, The Moorish Nation on the soil of North America, have been given a Prophet from Almighty God Allah (swt) so that we will return to Islam[ism], and then begin to bring the world back into the original and universal Divine Vine and Fig Tree and worship our Heavenly Father, ALmighty God Allah (swt), the Great God of The Universe. We know our duty is to manifest Almighty God Allah’s (swt) everlasting dominion upon the Earth-Land. We know this is all according to the Divine Plan of The Ages for our Redemption. 1. We will have superior food, superior clothing, superior shelter (land, property and real estate), superior education, superior healthcare, superior Business, and superior self-defense for all of our people, all of our families, all of our communities, all of our tribes, and all of our nations, and all of our race. 3. We will have the fullest upliftment, betterment, unfoldment, development, improvement, empowerment, advancement, attainment, accomplishment and achievement of our people on all local, municipal, national, international, intranational, supranational, global and universal levels. 4. We will have everything that is politically, economically and socially necessary for the highest heights of human civilization, beginning with everything our fathers, forefathers, and ancient forefathers produced and provided for us and our posterity (future generations). it is our purpose, duty and goal to excel far beyond all past achievements of our fathers, forefathers, and ancient forefathers. 5. We will take the teachings of the Moorish Divine National Movement, and Moorish Science Temple all over the world for the benefit and betterment of all Asiatics worldwide, this is "The Uniting of Asia". These principles are their inherited, inherent, inalienable and invincible birthrights as the sons and daughters of Asia. Asia means the essence, substance, seed and part of Almighty God Allah (swt) made manifest in flesh. 1. We don’t want hand outs, we don’t want charity, we are not leeches, we do not piggy back others, we have our own, if we do not have it already, we will produce it ourselves for ourselves, and that’s all we need for our own Divine and Earthly Salvation. 2. We don’t want fake sovereignty, pseudo-sovereignty, paper sovereignty, or straw sovereignty, anything that is not real is not right for our Divine and Earthly Salvation. real Sovereignty means real Government (Governance of National Territories = gasses, liquids, solids and plasmas). our real Sovereignty (self determination) is the first real solution to the real problems our real people are really facing. 4. We don’t want to be anyone but ourselves, because when we are ourselves we are the very best. and we will not allow, accept, permit or approve of anyone or anything oppressing, suppressing, repressing or depressing the full expression/manifestation of our Eternal Rights as Divine Human Beings to produce and have our own, be ourselves, or determine our future. if the members of Almighty God Allah's (swt) Temple all magically appeared today, we are still Almighty God Allah's (swt) seed, and we still have everything it takes to rule the world again, we don’t need anyone else’s history, anyone else’s achievements and accomplishments, all we need is Almighty God Allah (swt), he alone is "Our God", the Almighty Father of the Universe, the Almighty Father of Love, Truth, Peace, Freedom and Justice. and we are his blessed and beloved people, the Moorish American Nation, part of the Universal Moorish Family of Nations of the Asiatic Race. 5. We do not want anything that does not belong to us, only that which is our Divine National heritage and inheritance is important to us, because if it is not about our Divine and Earthly Salvation it is irrelevant. We don’t need anyone else creating our world for us, we are creators, we will create our own. We don’t need anyone else dictating our future to us, we are dictators, we will dictate it for ourselves. Anything and everything that rightfully belongs to our people, will be returned to us soon enough. ***this demonstration is to be known by heart by all members of "Allah's (swt) Temple" The Original, True and Divine Moorish Science Temple of America, founded in 1913. IF I CAN GET YOU TO THINK AS A MENTAL SOVEREIGN FOR YOUR OWN GOOD, IMPROVEMENT AND EMPOWERMENT, I CAN GET YOU TO SAVE OR UPLIFT YOURSELF!!!! NEVER STOP AGGRESSIVELY PROGRESSING AND MOVING UPWARD, FORWARD AND ONWARD TO REACH THAT SOVEREIGN AND SUPERIOR STATE OF EXISTENCE!!! THIS HAS BEEN ORDAINED BY ALMIGHTY GOD ALLAH (swt) FOR YOU AS HIS SONS AND DAUGHTERS, HE HAS PREDESTINED YOUR LORDSHIP OVER THE PLANES OF SOUL AND MANIFEST, THIS IS HIS DIVNE PLAN OF THE AGES FOR YOUR PERFECTION, NOT MINES, AND NOT THE DEVILS OR EVIL SPIRIT[S/ED] WHO WANT YOU TO FAIL AND STAY IN A FALLEN STAGE!! !